Rick’s passion for mechanics started when he was a child. Some of his earliest memories are of watching his father drive a tractor, spending hours simply observing the machine move back and forth across the field. He enjoys figuring out how things work, especially if it has an engine. As a child, he started with smaller motors and engines (one even won him 2nd place at the State 4H competition), but as his passion grew up so did the machines. Choosing a career path was easy. Rick knew he wanted to work with his hands, and combined with his love of machines, becoming a mechanic was the obvious choice. Finding the right shop was slightly more difficult. After honing his skills at vocational school, Rick bounced around to different mom-and-pop shops. He says they were good places but none were right for him. It was not until he found TransAm where he fit. This will mark Rick’s 20th year with TransAm Trucking. He started as a mechanic in the Truck Shop, advancing quickly and, if you ask him, a little by accident. Shortly after starting with TransAm, Management decided to cross-train its Shop employees with the Parts department. They quickly discovered Rick has a knack for parts. “If the part’s in Kansas City, I can find it.” More than that, Rick is organized. 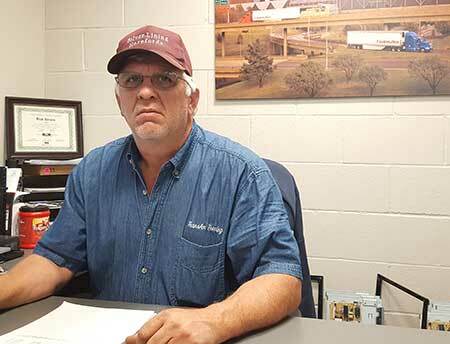 This combination earned him a promotion to Parts Manager just five years after starting with TransAm Trucking. Rick runs a well-ordered department. The Parts room is divided into two sections: Trailer/Reefer and Truck/APU. Each part in these sections is labeled and sorted by number, and inventory is done each day to stay on top of supplies. Everything has its place. When asked why he chose TransAm, Rick says it is because of the people. He genuinely enjoys working alongside his team. “It’s like family.” He especially thanks Frank and Murray for all their guidance and support throughout his career. Thank you, Rick, for choosing to make your career with TransAm Trucking. We are lucky to have you.